AUGUSTA, Ga. – This much we know is true: For Francesco Molinari, Continental golfer out of the old fairways-and-greens school, to win this 83rd Masters, he’s going to have to beat Bomber 1 (Jason Day), Bomber 2 (Dustin Johnson) and Bomber 3 (Brooks Koepka), among various others. Tiger Woods, for instance. Not a bomber, but still very good at golf. They met once before, at Augusta National. You might not remember. Asked by an American reporter if Molinari is ready to win “on this stage,” the Spanish golfer Rafa Cabrera-Bello said, “Well, he is the Champion Golfer of the Year,” and of course he is. We all remember how the signore won the 2018 British Open last July, paired with Woods in the Sunday finale. “I didn’t learn a great deal about the course, to be honest, because we were going sideways most of the times,” Molinari said Friday afternoon, in his endearing monotone that is more Bernhard Langer than Henry Kissinger. As he smiled broadly at the memory you could see his perfect teeth. His father is a dentist. Yes, the golfer’s father is a dentist, his mother is a retired architect, the brother has a masters in engineering, Valentina Molinari, Frankie’s wife, is planning to get a doctorate in child psychology — this is not a family likely to gather at the Hooters on Washington Road here anytime soon. The family vacations are in the Italian Alps, for skiing. Francesco was studying business at the University of Turin (founded in 1404) when he decided to turn pro. He speaks Spanish with his caddie, English (generally) in his interviews and Italian with his family. When Woods had his monster year in 2000, Francisco was starting his life as a university student. “He was not that much older than me, but he was the absolute idol for many of us — he was Michael Jordan,” Molinari said in a recent interview with GOLF.com. In other words, Woods played a game with which Molinari was unfamiliar. The young Italian was a pretty good amateur golfer who was getting better. Several years later, when he turned pro, Molinari signed with Nike, following Woods there. Nobody noticed. When Woods dominated the U.S. Open at Pebble in 2000, Molinari noticed. He’s one of the few people who can recall that Miguel Angel Jimenez, a sort of hero to many European golfers, finished in a tie for second that year, with Ernie Els. Woods finished 15 shots ahead of them. “It was ridiculous,” Molinari said. 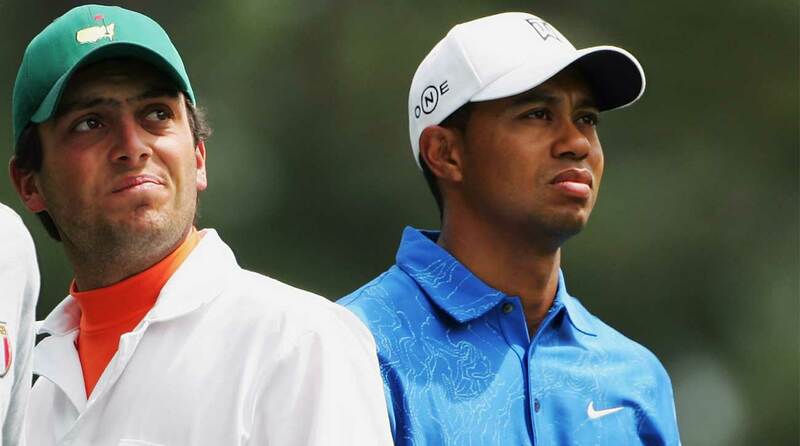 Francesco Molinari and Tiger Woods first met at the 2006 Masters. “To be there at Augusta [in 2006], to see him play from five yards away, was incredible,” Molinari said in the interview. “The week before my brother won the U.S. Amateur, we never would have dreamed that a few months later we would be at Augusta National, paired with Tiger Woods. I was massively nervous, from the excitement. I was living a dream, walking the fairways of Augusta, looking at Tiger. He didn’t play particularly well, but you could see he was completely different from everyone else. It was golf on another planet. Four years later, Molinari and Woods played against one another in singles at the 2010 Ryder Cup. Woods won, 4 and 3. They played each other again on the final day of the 2012 Ryder Cup, in the final group. They halved, when Woods conceded a four-footer on the last hole. Ian Poulter, the Englishman and Ryder Cup legend, has seen Molinari’s game progress remarkably over the past dozen years. Molinari’s game, Poulter said on Friday, “is pretty darn good. He hits it straight, he’s now got a fantastic short game and he holes lots of putts. So I mean that’s the reason why he’s got the Jug. “He’s a major winner, he’s won multiple events, the form he’s been in in the last two years is quite incredible, and he’s raised his game from an all‑around perspective. And he’s mentally stronger than what he was. So he’s got the whole package.” Shrouded in incredible modesty and a truly gentlemanly manner. There’s really nobody like him in professional golf today. “I should probably tell Tiger, the next time we play together, that I first met him at the Masters,” Molinari said last month. He could get that opportunity this weekend. Tiger just needs to continue to play well.